So, I needed something to make a downpipe with. 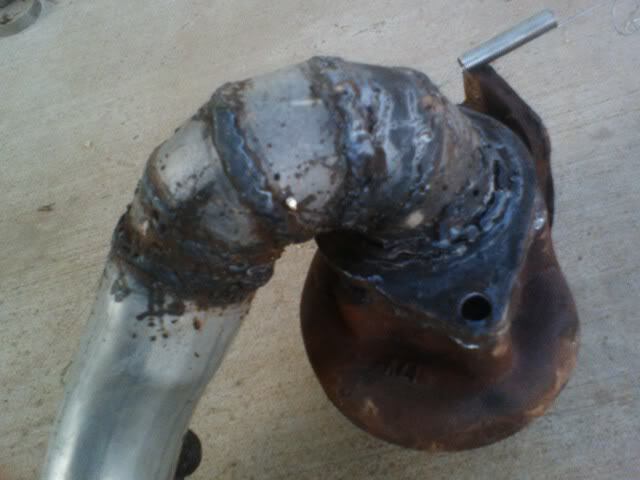 I had already mad a downpipe using my stick welder. 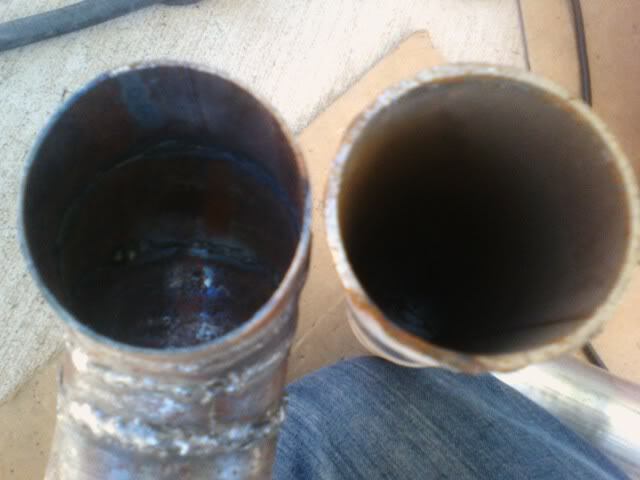 The down pipe worked but I just wasn't happy with it and was looking into buying a Lincoln 140 for $469. The thing was I really didn't know anything about mig welding or fluxcore. I have been brazing with oxyacetylene for about 3 years. 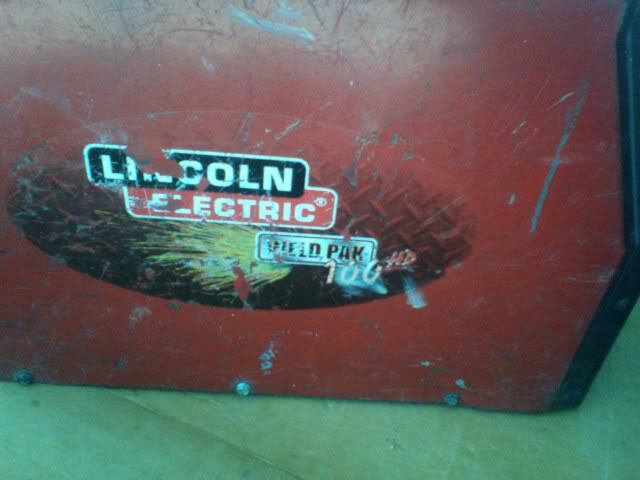 Then I find this Lincoln weld-pack 100 for a $100 bucks used. I figure it's worth a shot and take it home to try it out. At first I had some trouble feeding the wire thru the gun. I proceed to take the gun apart and work the wire true and guess what the thing works better than I could have Imagined. I started messing around with it today and made some stuff. The first one is some realy thin steal that I was told was 16 gage. I used the lowest setting (A-1.5). 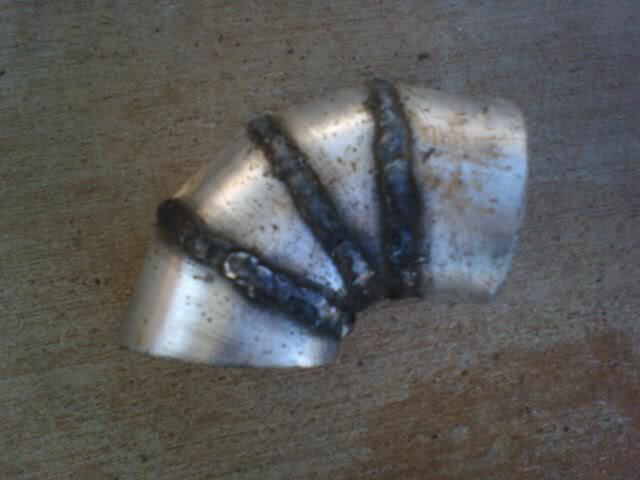 Her is the first downpipe I made with a stick welder. 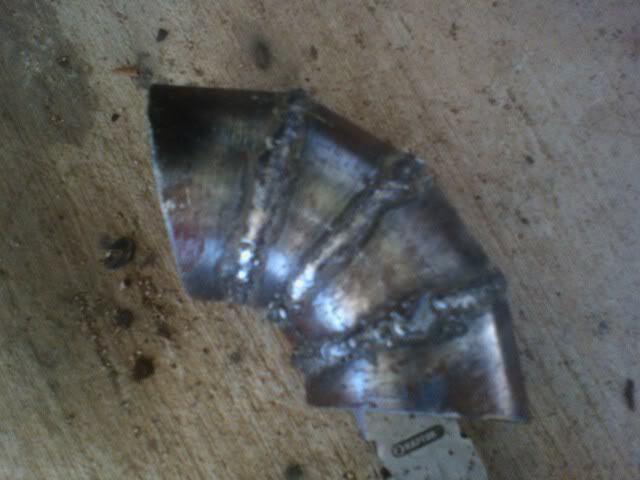 this was my first time welding with an arc welder and it still worked out OK. The fluxcore is a lot easier to use and ALOT OF FUN! Your welds like good for little experience with fluxcore. The idea is to keep wirespeed low, much lower than MIG. When you get it right, it sounds more like ripping paper than frying bacon. Just clean the metal up both before & after, use some anti-splatter spray, and you'll get decent results. 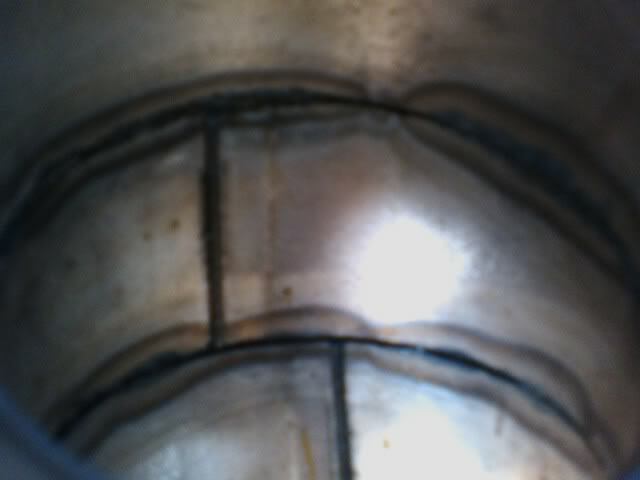 Like I've said a million times, birdshit welds are impossible with fluxcore if you read up on the welding process a little. You can actually make some nice welds with it. That's the same welder I'm forced to deal with at work (tool rental), and so far the welds have held up a couple 2-ton mini skidsteers for over a year. It was also good enough for the boom on one of them, which is rated for lifting 900lbs (constantly, has done more). You just have to clean the surfaces well, and make multiple passes for really thick stuff. Fluxcore is the same theory as stick welding, except you don't have to move left-right as well as inwards. thank's man, I'll have to look for that anti-splatter spray stuff. I found this thing at a welding shop that was going out of businesses. 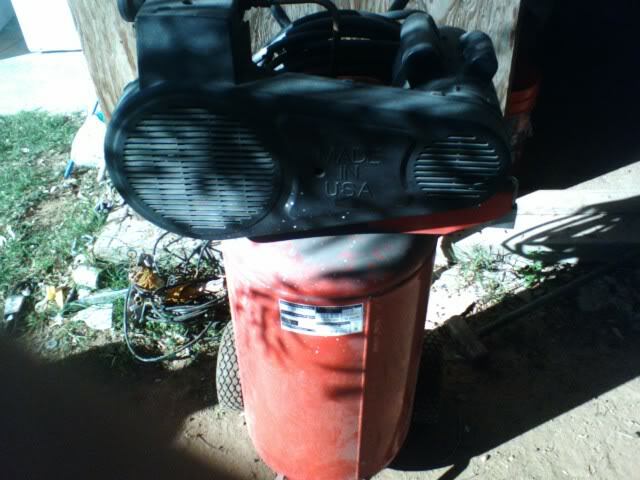 I got the welder with 5 clamps and some welding gloves for $100 and I also got this sickass compressor for another $100. You can get anti-splatter on ebay, welding shops, and I think even places like Homeboy Depot. Its a lot like PAM, except you're baking steel not marijuana brownies. 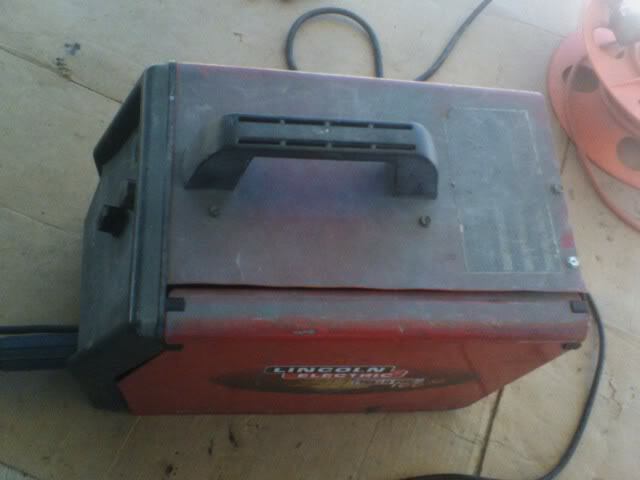 I just recently purchased a mig welding machine, I do not have that much experience just what my father taught me as a teacher which I forgot along time ago. Your work looks great, for welding for an arc for the first time. Did you practice a couple of times to get the hang of it? Or did you just start doing it, if so it's really great. I was worrying that, I wouldn't be able to do anything big until i got the hang of it but, these pictures motivated me. I'm going to see what i can fix up! 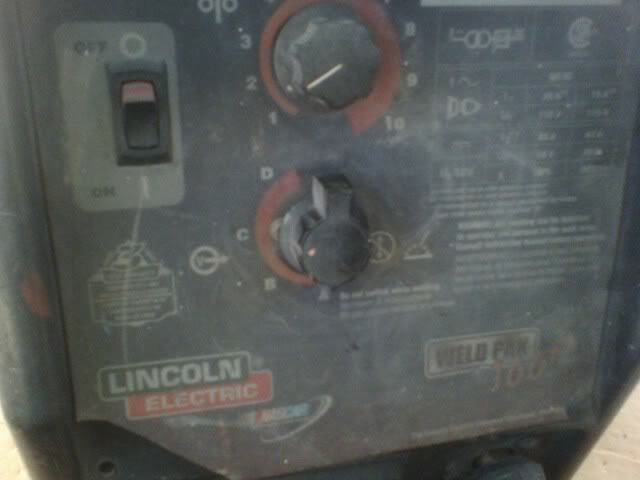 Lincoln Weld-Pak 100 (115 V) ??? Turbo Oil line return...to weld or not to weld? ?